I think I overdeveloped the first roll, and I fogged about a third of the second roll wrestling it on to the developing reel, but I did get a few reasonably good photos. 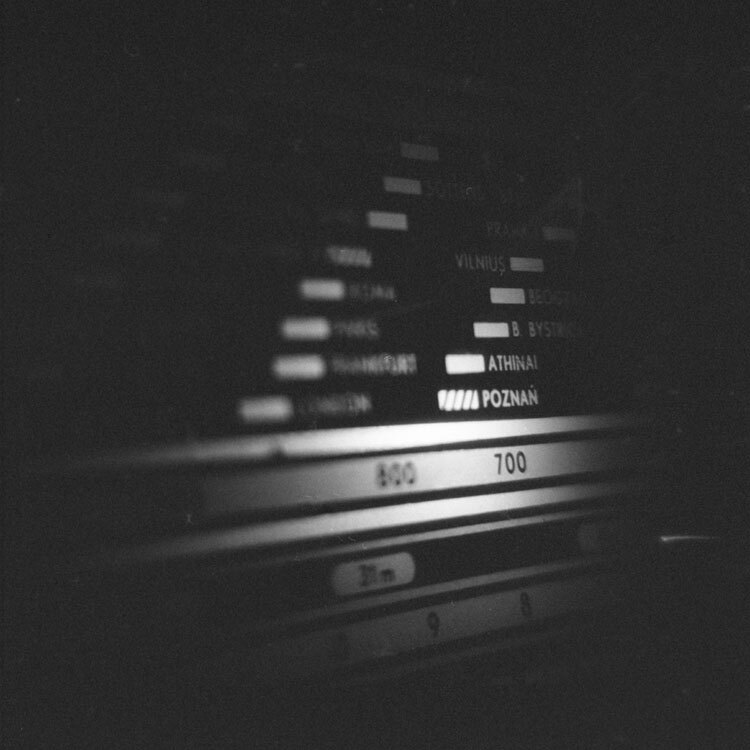 I particularly like this shot of my 1960 Diora Calypso, a Polish radio that was, um, inspired by West German radios of the era by companies like Grundig. The shot is pretty dark; I shot it at about 3 o'clock this morning in available light, which as it turns out here was basically the light from inside the radio dial. 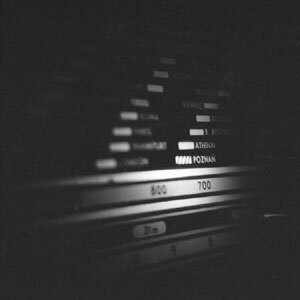 The AM dial on the radio has a bunch of European cities listed on it, basically as a tuning aid. The Polish stations, like Poznan, have a little cross hatch in their tuning bar to make them easier to find. I had a close up lens stuck to the front of the camera with gaffer's tape so that I could get this nice close up; usually the camera doesn't focus any closer than 4 feet, but I was about 8 inches away for this shot. The 3200 speed film doesn't really work that well in the Diana, or maybe I just need to adjust my expectations for how much light it needs even with that wicked fast film. 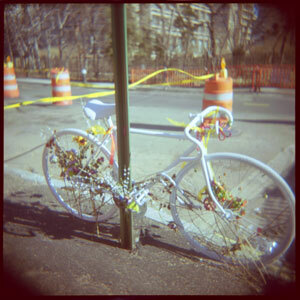 I've got one more roll of 3200; I think maybe I'll load it in the Holga and see how that camera does with it. Needless to say, this wasn't something I could just cart off to the dump or place in the approved garbage receptacle. The door was unlocked and the window and glovebox were open. I poked my head in and found a registration card that didn't list one of our neighbors, so I immediately removed myself from the scene and called the police and gave them the license plate number. 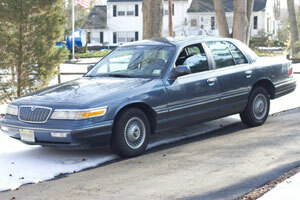 A couple minutes later, they called back and said that it appeared to be a car that a neighboring town was looking for. Yup. Someone gave us a stolen car. It was awfully considerate of them to refrain from parking us in. After years of resisting, I've finally joined Flickr and started uploading photos there. I'm not sure how much duplication there will be between my Flickr photostream and what I post here. This photo, shot a couple of days after Valentine's Day in Red Bank, is also up on Flickr, but there are some other photos there as well that I haven't posted here. I think this is all part of feeling a need to more fully explore the "social software" sites out there. Generally, I like doing things on my own; I wrote my own content management system to run There Is No Cat and Geneablogy rather than adopting something off the shelf, for example. I like learning how to do this stuff. The social software sites are less amenable to self-implementation, though. I have very mixed feelings about giving up control over my own content, over its presentation, over relying on a third party, and over provding the requested information to a behemoth like Yahoo! So this is an experiment for now, I think. Laura and I went to see re-formed 1980s independent pop sensations The Bongos at Joe's Pub in Manhattan last weekend. They played their album Drums Along The Hudson in its entirety and in order, which is kind of strange, because it's a collection of singles, not a concept album or anything. Go figure. 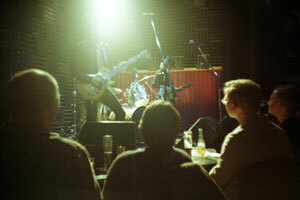 I brought my new Lomo LC-A camera to capture the action. I had no idea how hot the show would get. I certainly didn't expect spontaneous human combustion on stage. 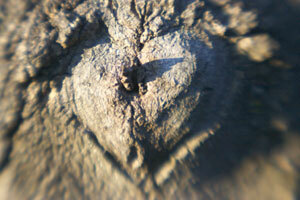 This tree in our back yard would like to wish you a happy Valentine's Day. We hope your weather is better than the ice storm we're currently experiencing. Good thing we didn't have plans to go out for dinner tonight. More Holga shots. Weekend before last, Laura and I went into the city to see Factory Girl , the Edie Sedgwick biopic. (Don't bother; it wasn't that good.) I brought my new Holga with me. More photos and commentary in the usual place. I bought a(nother) new toy camera a few weeks ago, a Holga. I was getting kind of tired of the guys at the local dip-and-dunk complaining about the gyrations they had to go through to print pictures from my Diana; it shoots roughly 4.5 x 4.5 centimeters rather than the usual 6 x 6 centimeters of a square medium format camera, so they had to manually zoom in on each picture and such rather than let their automated machines handle it. Fair enough, I guess. 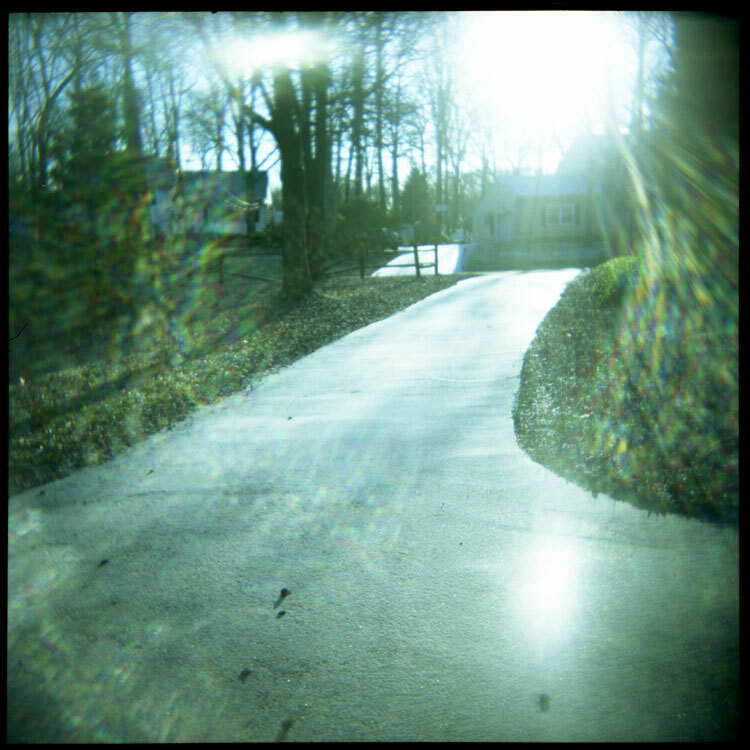 So I got a Holga, which shoots 6 x 6 (or 6 x 4.5, another standard format for 120 film). I screwed up the first roll I put through it. Classic mistake, a consequence of poor user interface. The Holga can shoot either of two formats, as I mentioned above, depending on which insert you place into the camera body. I placed the 12-shots-per-roll insert in, which shoots square pictures. On the back of the camera, there's a window to show you the frame numbers with a little sliding piece of plastic to expose the numbers for either 12 or 16 shots per roll (120 film comes printed with both). There's a little "12" and "16" embossed in the plastic. I figured you wanted to have the window open next to the appropriate number. Wrong. I missed the embossed arrow on the sliding piece of plastic. It points to the number. So when the arrow is pointing to the embossed 16, the window next to the number 12 is open, and the numbers displayed are for 16-shots-per-roll. Oops. I realized I had screwed up after I shot photo number 12 and started winding only to come across an unexpected number 13. Damn. I figured I would have the roll developed anyway, but not have it printed or cut, just in case there was something interesting on there. And that's how I created this little triptych of my favorite local landmark. My second and third rolls were better. I had them printed, but wasn't terribly impressed. 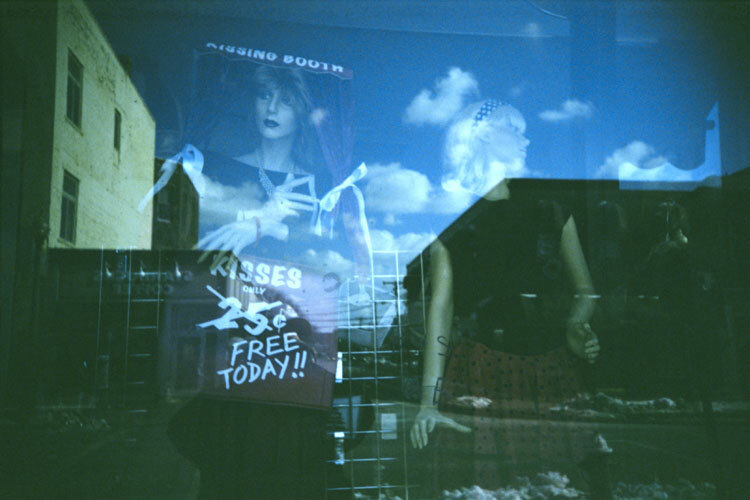 Where was the vignetting that's supposed to be characteristic of the Holga? Why are the colors kind of flat? I finally broke down this week and bought a scanner capable of scanning 120 negatives, an Epson Perfection 4990. Turns out the guys at the dip-and-dunk seem to be burning or cropping some of my photos so the vignetting doesn't show up. 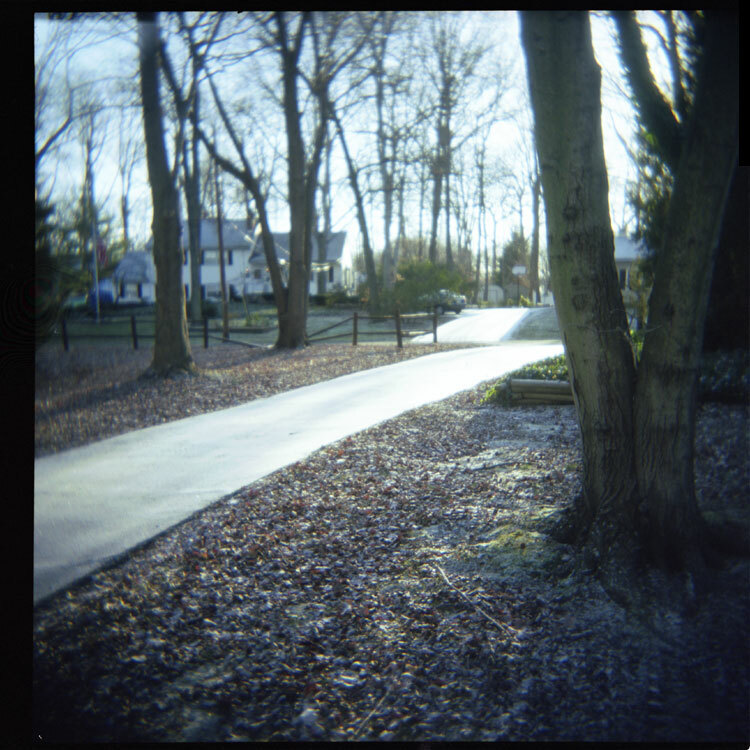 Scanning my negatives, the pictures look more like what I would expect from a Holga, as seen in these two shots from a recent morning where we had had a dusting of snow that stuck to the pavement but not so much to the grass. I particularly like the flaring on this one; it looks like a shock wave of color exploding from the sun or something. 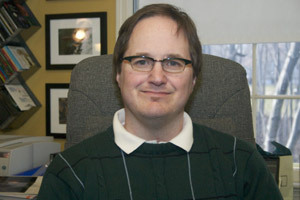 The photo is a link to a larger version that better shows what I mean than this thumbnail. I'm still learning how to use this scanner. Scanning negatives seems rather different from scanning prints. 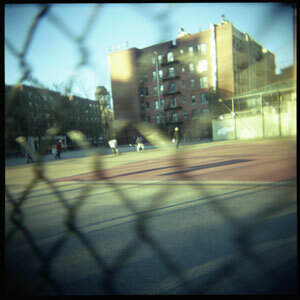 One thing that's interesting is that revisiting my photos from the Diana, they look even more vignetted and distorted. The guys up at the corner are just too good; they want to make my crappy photos look better. I'm delighted to see this announcement from the Web Standards Project of their new working group, the International Liason Group. The ultimate objective of the group is to make the educational resources of WaSP about the benefits of using web standards to develop sites and the mechanics of doing so available in the languages of working professionals around the world. I've been working on this for the past several months despite my unfortunate linguistic handicap of being monolingual (oh, the shame!). Still, I've been able to pitch in; I co-ran the initial task force leadership vote (with Michael Grosch of Germany), worked up an information architecture for the next version of the ILG site, and wrangled the Google Maps mashup on the page listing the task force members so that it's accessible and works (mostly) in all modern browsers and even some not-quite modern ones (and still functions acceptably in everything else, although without the benefit of the map; I hope to write up what I did to make that happen in the next few days). I think that the two leaders chosen in that leadership vote lo! these many months ago, Steph Troeth and Glenda Sims, have done a stellar job steering the group to this day, and I've really enjoyed working with them. WaSP tech maven and new co-group-lead Kimberly Blessing has also been a joy to work with. And major props to Molly Holzschlag, former group lead of WaSP, whose idea the group was in the first place and who got the ball rolling. It's been a real pleasure working on this, participating in the spirited discussions with a lot of like-minded developers from around the world. I have a lot of respect for the members of this group.